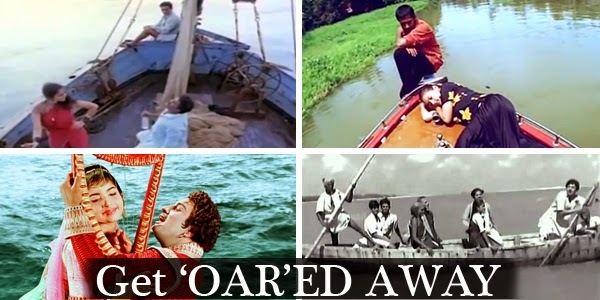 Like how cars, trains have been used in cinema as a wonderful location to shoot songs, it is not surprising to note that ‘boats’ have also been used in many songs. It may seem easy to just look at the visuals but how difficult would it be to shoot a song on a boat? Imagine the technicalities involved too, and moreover the risk of shooting on a boat that keeps moving on a water! But even amidst these difficulties there have been some songs shot on the boat too and definitely we have to agree, the boat does add to the aesthetics in many ways. Tracing back to the times, when Ulagayanayagan was at his peak with Nayagan, there was this one particular song that made it to the talk of the town and well ofcourse the song is none other than the Kuyili starrer – Nila Adhu Vanathu mele. Definitely intoxicating we must say! When we think of boats, we cannot fail to think about the waves that keeps a boat moving. And the Tamil word ‘Alai’ speaks infinite words. So keeping the ‘boat’ and the ‘Alai’ in mind, is there a song that comes to your mind? Well we can think of ‘Asaiye alai pole’ , a song bringing across many life lessons sung by Trichi Loganathan. Forwarding to the recent era, Surya starrer Nanda had a beautiful romantic song on a boat – ‘Mun Paniya’, subtly bringing the love in them, as delicate as the ocean living creatures. ‘hey goodbye Nanba’ yet again scored high amongst the ARR fans, thanks a tipsy kind of tone, not too hard on vocals, making it a easy hummable track too and ofcourse, beautifull shot by Mani Ratnam in the middle of the sea!